light and rich at the same time, summery but cozy, zippy but not overwhelming…oh man. This is the summer soup your squash blossoms have been dreaming of. A basket of Happy Boy pardons or about 2 poblano chiles, roasted, peeled (as best you can), deseeded and chopped into strips. 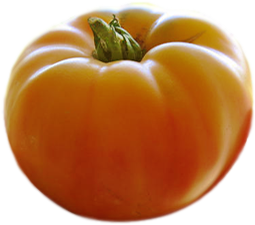 If you use pardons, I wouldn’t bother peeling them and don’t deseed. Tip on how to roast, below. 1. In a good-for-soup pot or dutch oven, melt butter over medium heat. 2. Add chopped onion, and cook until light gold. 3. Scoop out half of the onions and set aside. 4. Add stock and potato to the pot and bring mixture to a boil over medium-high heat. 5. Once boiling, drop the heat and simmer, partially covered for about 20 min. 6. While that’s happening, remove the base of the squash blossom stem and take out the stamen. Cut them into strips. 7. Add half of your blossom strips to the stock and cook for a few minutes. 8. Blend your mixture. BE CAREFUL! If you have an immersion blender, use it (and can I borrow it?). If you’re using a blender-blender, work in batches and do not burn yourself! 9. Put the mixture back to the pot over medium heat. 10. Add the chopped, roasted poblano, milk and the rest of the onion to the soup, and stir. 11. Simmer for 10 minutes then add zucchini and corn. 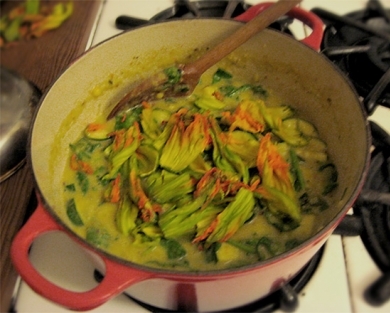 Simmer for another few minutes, then add the other pile of squash blossom strips. Take off after a couple of minutes. 12. Stir in yogurt and add salt to taste. 13. Serve in soup bowls and finish with a sprinkling of chopped epazote or flat leaf parsley. If you have some epazote (or cilantro…or parsley even), sprinkle some on top! And if you eat this soup with a little quesadilla and a small salad with toasted pepitas on it…you will be correct. If you are using our lovely pardons, chop off the stems and very tops then pan-fry them in a tiny amount of oil (don’t want them to be oily at all because you’re incorporating them). Let them get nice and toasty. under a little stream of water can help with this). It doesn’t have to be perfect, the skin is just a little bitter. 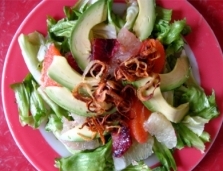 Get off what you can, cut them open, deseed, and slice into strips! Or for either, if you have a bbq and are out there anyway…stick ‘em on!